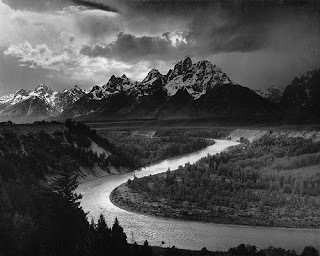 The Grand Tetons of Grand Teton National Park rise in Wyoming in this Ansels Adams photo from the 1940's. Wyoming is home to two amazing national parks - Yellowstone NP and the Grand Teton NP. French trappers named the three spectacular peaks known as South, Middle, and Grand Teton. These effectively form the centerpiece of a National Park known for beautiful lakes, rivers, aspen forest, and towering majestic mountains. Although the Grand Teton requires some technical skill to climb, Middle and South can be scaled without special equipment though the hike is steep and rocky.